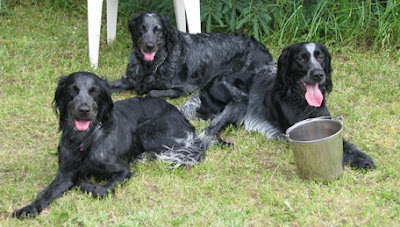 The 2012 Blue Picardy Spaniel picnic was a great success! The rains came BUT the sky cleared just in time for all the Blues and their owners to enjoy a great afternoon. We had 39 people and 24 Blues. To have that many Blue Picardies all in one spot was such a thrill for me as there are only about 250 or so in North America. It was great to meet little 3 month old Alex who came with his parents Dave and Dana to meet the relatives of his "big brother" Maverick. 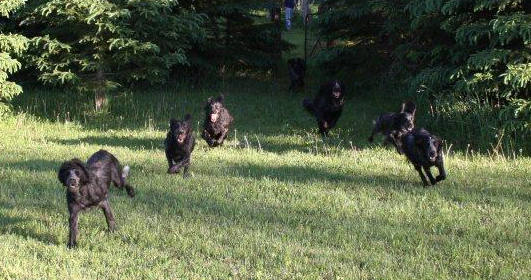 Dani at 11 years plus was our oldest Blue to attend and 5 month old Remy was the youngest. We even had two families, one from Michigan and one from Aurora who don't own a Blue but came to meet and learn about the breed. I also need to mention how blessed I am to have the best kennel help available, my other half Dave, has spent many years fixing this and repairing that so that our dogs are safe and secure. When I asked about putting up new fencing, Dave got to work and started the project. When I said I would like it finished for the picnic, I did get "the look" but the fenced was completed and the visiting Blues had 2 new acres to explore and play in. Thanks again Dave, I couldn't do this without you. Of course our granddaughter Katelyn and her friend Taylor made sure that desert was provided for the picnic. The 2012 Blue Picardy cupcakes were a big success, thanks Katelyn. Dave and I certainly enjoyed the day, it is always great when "our puppies" and their people come to visit. The Blue Picardy is a lovely breed and we think that all their owners would agree. Let's go! It's PICNIC TIME!!! The Brighthope Blues are gearing up for this weekend. Some are getting haircuts and everyone is getting a bath, WHY? Because their relatives are coming for a picnic and they want to look their best. Actually they really could care less how thay look, they just want to have a good time, it's the two legged pack member that thinks they should look good. Yes, the Blue Picardy Picnic is just days away. What do you do when you have 25-30 Blue Picardies and their owners all in one place? Well you eat, talk about your Blue, play some games, take lots of pictures and talk about your Blue. At the last picnic one person was over heard commenting that "they thought their Blue was not very well behaved, until they saw someone else's Blue steal a hotdog off someone's plate". Come and celebrate the Blue Picardy Spaniel with us. Looking forward to seeing all our puppies and their people. You are welcome to attend even if you do not have a Blue, but would like to learn more about the breed.